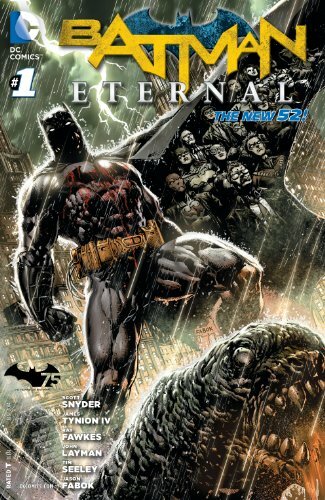 Until August 3, 2014, get "Batman Eternal #1" for free by using promo code "BATMAN75". 1. Click the "Enter Your Code" button below, you will be asked to sign into your Amazon account if you are not already signed in. Enter the code into the box and click the "Apply" button. Please click "Apply" only one time and wait for confirmation. 2. Once your code has been entered, follow the instructions below to receive the title. The discount will be applied automatically but will not show until you receive your purchase confirmation email. 3. If your code has been successfully entered, you will see the following message appear: "Promotion successfully applied to account". The Kindle promotional credit will not increase your Amazon Promotional Code or Gift Card balances, but it has been added to your account and will remain there until it has been applied toward your purchase of "Batman Eternal #1" or until it expires on August 3, 2014. If you receive an error message after entering your code, check that you've entered the code correctly and that the promotion is still valid and has not expired. If you still receive an error message, contact Customer Service via Kindle Support. 4. On the "Batman Eternal #1" detail page click the "Buy" button and your promotional code will be automatically applied to your purchase. Please note the code can only be applied toward the purchase of this Kindle book. 5.You must redeem your promotional code by 11:59 pm PST on August 3, 2014. 6. You can confirm that the promotional credit was applied to your purchase by checking your order confirmation, which will be sent to you by e-mail. The visible price will not change before purchase, but the promotional credit will be automatically applied to your order. After your purchase, you can confirm that your promotional credit was successfully applied by either viewing your order details on the purchase confirmation page or checking your order confirmation, which will be sent to you by e-mail. • Promotional credit can only be used for the eligible Kindle book listed on this page and is not redeemable for any other types of merchandise sold at Amazon.com. • Only redeemable at Amazon.com. • Additional taxes apply in certain jurisdictions. • This is a limited time promotion. You must use your promotional credit towards the purchase of one of the eligible Kindle books by 11:59 p.m. (PT), August 3, 2014. • Promotional offer of the free Kindle book is limited to one per customer. • Promotional credit valid for customers located in one of the 50 United States or the District of Columbia only. • Customer device must be registered to the same customer account as the qualifying Kindle book purchase. • Offer is not transferable, not resalable, not exchangeable and not redeemable for cash. • If you violate any of the Terms and Conditions, the offer will be invalid, and the offer discount will not apply. • Offer may not be combined with other offers. • If you return items purchased using a promotion credit, we will subtract the value of the promotion code from your return credit. • We reserve the right, in our sole discretion, to terminate or modify this promotion.